An exhibit from Germany is making its way through the United States on an aspect of the Holocaust where millions of people were slaughtered by the Nazis. This involved Nazi Germany’s eugenics program whereby the mentally retarded, those with disabilities and those considered of an “inferior race” were forcibly sterilized and then murdered. The doctors and nurses conducted horrible, unspeakable experiments on those deemed unworthy of the New Order. The Nazis tried to make sure that only the “healthy, the pure race” Germans survived. Their experiments caused such horrific atrocities that forced sterilizations have become a crime against humanity as stipulated by the Rome Convention and has been labeled and can be tried as a war crime by the present International Criminal Court should such a thing be practiced today. Ironically, many countries, including the United States, practiced forced sterilizations well into the 20th Century against the mentally retarded, against the physically disabled, and against non-white minorities. In fact, the United States was the first to begin the practice in the 19th Century. The State of Indiana passed a state law in 1907 requiring that all mentally retarded and physically disabled be sterilized. Other states followed, and the U.S. Supreme Court declared a similar Virginia law legal in 1927. Thus, forced sterilizations became legal throughout the United States wherever such laws were passed. 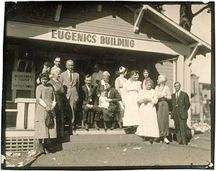 There is no question that the idea of eugenics (preserving a superior race through preventing those considered inferior from breeding) very much played a role in the forced sterilization programs in those American states that had such laws. It is a sad truth that the whole idea of eugenics was accepted back then. We have to remember that American society was a racist and racially divided country. So, forced sterilizations of the mentally retarded, the physically disabled and even non-whites was considered perfectly acceptable. What the Nazis did was take the whole concept of eugenics and forced sterilization to a truly low and ghastly level. Not only were the mentally retarded and physically disabled forcibly sterilized, but they were also brutally experimented on. Under the Nuremberg laws passed by the Nazis in 1934, it was also acceptable to forcibly sterilize, experiment and murder people for their religious, political and moral convictions as these people were deemed “inferior.” When World War II ended, and the full horrors of the Nazi regime were exposed, many Americans came out against forced sterilizations. Eventually many of the forced sterilization laws were overturned. Nevertheless, these laws continued into the 1960’s. Such acts today are now considered barbaric and crimes against humanity in America. Sadly, there are countries where forced sterilizations have and still occur. Two examples I can give are Uzbekistan and China. In both cases, such things are being carried out in the name of “family planning.” Forced sterilizations were also carried out in Peru in the 1990’s by the administration of Alberto Fujimori against indigenous women. The exhibit on the Holocaust is a hard lesson on the dark side of humanity and what we should learn from it.